Capcom has responded to allegations its mobile game, MaXplosion, is a naked ripoff of the downloadable hit 'Splosion Man, developed after the original game's creator approached Capcom's console division about publishing it. Capcom says it is "saddened" by the situation. Did Capcom Totally Copy Someone Else&apos;s Work? 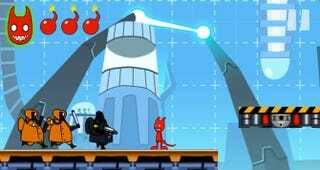 Earlier this week, Twisted Pixel, the studio that made 'Splosion Man in 2009, accused Capcom of plagiarizing the idea in a mobile platform game, but indicated it wouldn't pursue the grievance for lack of legal firepower. Capcom, in a statement widely distributed today, appeared to attribute the controversy to coincidence though it acknowledged it looks bad for the publisher. "Twisted Pixel did have discussions with our console game team about publishing ‘Splosion Man' on game consoles," Capcom said. But Capcom Mobile, which produced MaXplosion, "is a different division of Capcom with separate offices and as such, had no prior knowledge of any meetings between the console game team and Twisted Pixel." Capcom said MaXplosion, for all its resemblance to 'Splosion Man, "was developed independently by Capcom Mobile. Nonetheless, we are saddened by this situation and hope to rebuild the trust of our fans and friends in the gaming community."